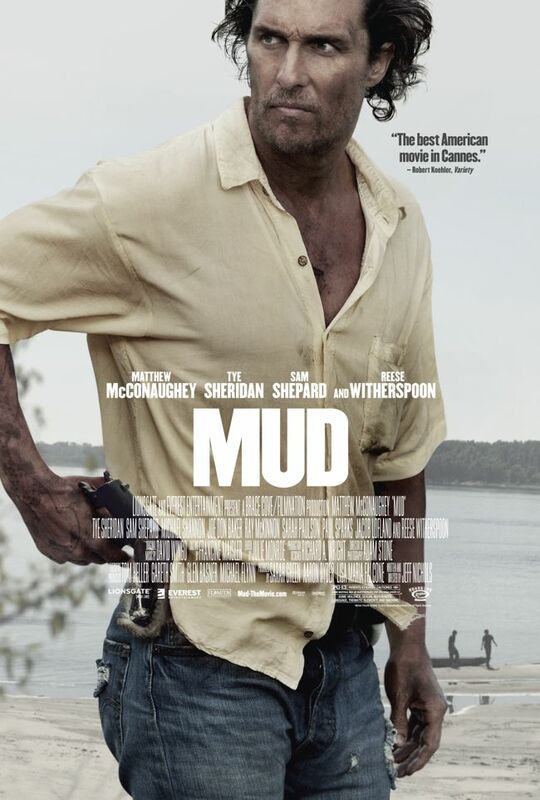 Much like the water/soil mixture of the same name, Mud, Jeff Nichols’ latest film, is a mixture of a number of elements. This is part “coming of age”, part love story and part mystery/thriller. While sometimes films fail when mixing so many themes together, that is not the case here. With Mud, all ideas are expertly interwoven in a film that is as American as it gets. Set deep along the Mississippi River in rural Arkansas, Mud tells the tale of two 14-year-old boys, Ellis (Tye Sheridan) and Neckbone (Jacob Lofland), who together share a wild adventurous spirit. They ride dirtbikes and regularly sneak off on afternoon boat trips to a hidden island down the river. One day, they notice a boat in a tree on this island. While exploring what they believe to be their new treehouse, they discover that someone is actually living there. Shortly thereafter, they meet this inhabitant, a man who only goes by “Mud” (Matthew McConaughey). It turns out that Mud is on this secluded island for a reason — he’s on the run from the law. The fact that he is a wanted fugitive doesn’t deter the boys from developing an unlikely friendship with him. As Mud tells them about his long-lost love, Juniper (Reese Witherspoon), the boys make an oath to help him find his lady and ride off to the sunset. There are other factors at play as well. Ellis is feeling distant from his soon-to-be-separated parents (played by the fantastic Ray McKinnon and Sarah Paulson), and surely this is part of the reason why he is so drawn to Mud. Ellis also has a love interest of his own — Maypearl (Bonnie Sturdivant) — with two first names, just like his mother. No matter that she is a few years older than him; Ellis is the type of feller who isn’t afraid to ask her to be his girlfriend after just one date. The comradery between Ellis and Neckbone is tremendous. These two young boys really do feel like they are best friends, and both are expertly portrayed by relative newcomers to the acting biz (Sheridan was in The Tree of Life, this is Lofland’s first film). Matthew McConaughey also takes an exceptional turn as the multi-layered Mud. After several excellent Southern-fried roles in the last few years (including Killer Joe and Bernie), this manages to stand out as his best work. The supporting cast here is terrific as well. Reese Witherspoon is a surprisingly good fit as the damaged and confused Juniper, Ray McKinnon and Sarah Paulson make for a strong pairing as Ellis’ disgruntled parents, and Sam Shepard has a memorable appearance as the grizzled old vet who lives across the river. Even Nichols favorite, Michael Shannon, has a small role as Neckbone’s uncle/guardian. Mud is very much an enjoyable film, but it does suffer from two notable flaws. One, it runs a little long. The film’s pacing is slow and methodical, which isn’t a problem in itself, but certain subplots and minor characters could have been reduced or even omitted with minimal loss. Two, the explosive final act feels a bit out of place after the slow burn drama leading up to that point. While exciting, the transition to this action setpiece is jarring. Regardless, Jeff Nichols has delivered another engaging film, one that especially nails its Southern setting. Everyone involved feels like a real Southerner — even McConaughey is touched up to look more rugged — and it’s hard not to get attached to most of these characters. This is a film that makes us feel like teenagers again, and through their eyes, it’s not hard to empathize with ol’ Mud. From your detailed critique, ‘Mud’ looks and sounds like the best parts of an early Carl Hiaasen backwater novel, like ‘Double Whammy’ or ‘Skin Tight’. Mixed with the camaraderie of the teenage boys in King’s ‘The Body’ and its later, ‘Stand By Me’. McConaughey is showing much more of a penchant for drama and light action revealed in ‘Reign of Fire’ and ‘The Lincoln Lawyer’. And that’s a good thing! Hi Jack, thanks for checking this out! After a decade of subpar offerings, McConaughey has delivered several inspired performances in a row. Even in lesser films like The Paperboy, he shines. And what’s great is that Mud may be his best role yet — really hope you can catch this one soon! Thanks for the heads up. I’ll look for it. Excellent review, glad you liked it. I really can’t wait to see this. Thanks man, hope you enjoy it as much as I did. Oh, awesome that it’s good. I didn’t even know Sarah Paulson was in it, I like her a lot. Also it looks like quite a change and fun part for Witherspoon. Yeah, this is the best I have seen from Witherspoon since.. Walk the Line, I guess. Both her and Paulson are great in their supporting roles here. Amazing performances all over the board, but the one I really went crazy over was Sheridan and how I think this kid is going to have a bright future ahead of him. Good review Eric. Couldn’t agree more about Sheridan. He’s really starting to make a name for himself. Hopefully he turns that into a nice career. Awesome! So glad to hear you liked the movie. It’s my favorite film of the year so far. As an Arkansas guy I can really appreciate what Nichols did. It was an easy review for me to write and I can’t wait to see the movie again. You know, I’d call it my favorite movie of the year so far, too. I haven’t seen too many, but this one really delivered. Nichols is 3-for-3 now in my book. Yeah, that’s too bad you weren’t able to make that screening, Ruth. Hopefully it gets a wider release so you can see it soon. I think you would really like it. Sounds good Eric! Even if I didn’t get to see it on the big screen I’ll be sure to rent it. I just saw Bernie last nite and Matthew was good in it too, he seems to play lawyers a lot, ahah. Haha yes he does. And he seems to take on a lot of Southern roles — pretty much every film he has made in the last couple years is set in the south. Nice review here. It is good to see McConaughey in a solid movie again, and Reese WItherspoon too… For a long time I just completely dismissed him as the redneck version of Hugh Grant but stuff like this is going a long way to make me reconsider. Thanks man. Yeah, McConaughey was in a rut for quite some time, but he has been able to string together a number of great performances lately — Killer Joe, Bernie, The Paperboy, The Lincoln Lawyer, Magic Mike, and now Mud. Hopefully this pattern continues. Nice review. I’m hoping to see this film tonight. Thanks! Hope you were able to see it. Sounds great Erik, I am a big Nichols fan and really looking forward to the chance to check this one out. I think you’ll love this one, Adam. Nichols hasn’t made a bad film yet. Nice man, really glad you liked this one. Nichols makes films that just feels so damn authentic, doesn’t he? And you’re right, definitely engaging. Sheridan really killed it here. Kid’s got talent. Yeah, Nichols is quickly becoming one of my favorite contemporary directors. Really excited to see what he comes up with next. I enjoyed Take Shelter enough to give Jeff Nichols a vote of trust when it comes to Mud. It’s so refreshing to see Mathew McCoughnahey finally produce the kind of work that fits his talents. For many years we had seen him in one terrible movie after another. Maybe he got serious after he married? McConaughey is on a mission right now. Certainly seems he is set on proving himself and taking on much more challenging roles lately. This is one of his finest performances yet, and it’s well worth seeking out. I’m debating on watching this at the theater or at home. It sounds great but I’m sure it will translate ok at home. I also completely agree with what you said in the comments about McConaughey having a slew of great performances lately. The fact that you praise him so much here makes me eager to check it out. Loved your review. Thanks! Yeah, I think this one will be perfectly fine as a rental, but if you get the chance, it’s worth a shot in the theater. Some of the wide open shots of the Southern landscape are gorgeous. I think this is a great review. Neatly articulates what was good about this film and also runs over the few faults. Good work!